With the development of mankind, end number of things has developed, and science is the leader among all such developments. Chemistry being much important field of study has equipment and apparatus which can be used in all sorts of laboratories. Considering the various requirements in the lab, different sort of apparatus is developed from various materials but the apparatuses made from lab glass have remained inevitable in each and every process. Every process or equipment has its own set of schedule and according to it, the requirement of apparatus changes, but the apparatus ultimately used are made of glass only. Considering various processes the size and shape of the apparatus used may vary, but they are made from same glass material as glass equipment are considered more reliable than other materials. There are various sorts of glass are used for production of these apparatus. They are manufactured from Borosilicate Glass, Silica and Quartz, but apparatus made from Borosilicate glass are more common and cost efficient than others. With the help of various chemical processes, it can be given any shape and hence different types of apparatus such as Flasks, Beakers, Pipettes, Burettes, Volumetric cylinder, Funnels are produced. Each of these apparatus has different importance in different processes. There are a number of materials available in the market and number of chemistry apparatus in different material available. The question here arises when the apparatus may need to heat up, then why lab professionals use apparatus made of glass than other material. 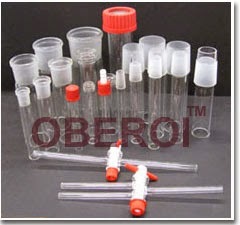 The answer to this question can be provided with the quality of the glass used for making such apparatus. For every experiment, perfect measurement of various chemicals and their composition are very much essential. A single error in it can lead the experiment or process to a great failure. Such accurate measurement is possible with glass apparatus only due to its clear vision and perfect transparency. Glass is a nonreactive material, which does not react with chemicals in it, and hence chemicals can remain intact. Glass apparatus is made to bear huge temperature fluctuation also. So can be used to provide heat to chemicals with open flames as well as used in the condensation process also. There is the end number of apparatus made from borosilicate glass with various shapes and sizes. Though they are made as per the standard size of industry practice, yet can be customized as per customers’ requirements also. The glass apparatus is made of inert glass, and hence despite its fragile nature, risk of accident reduces considerably. On various apparatus, there are measurement marks provided with the help of which professional can measure the chemicals accurately. Glass containers are used for holding the chemicals in them for a long time. One can also hold radioactive material in a glass container, which is not possible with containers made from other materials. These apparatuses can be cleaned and dried easily and hence quite easy on handling and maintenance. Labels: lab glass, labglass, laboratory apparatus, laboratory glassware, labs equipments, labs glass, labs glassware, latest equipment.